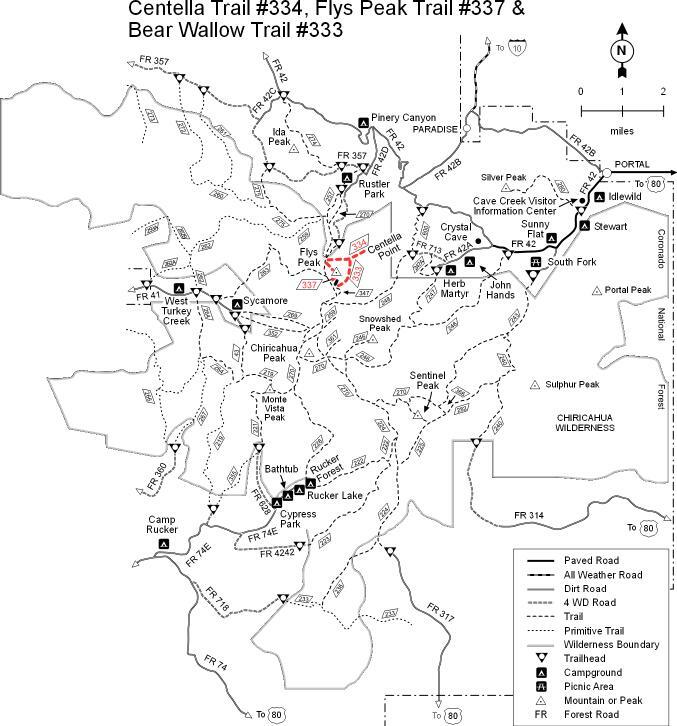 For travelers along the Crest Trail, and for visitors to Rustler Park looking for a scenic way to spend a day, here's a system of trails that leads to a number of interesting features including Flys Peak, Bear Wallow Spring, Tub Spring and scenic Centella Point. This trail branches off the Crest Trail #270 along the stretch that lies between Flys Park and Round Park, just south of the Wilderness Boundary. Centella Trail heads east from a junction where the Long Park, Crest and Flys Peak trails intersect. The trip to Centella Point, with its panoramic overlooks of the Cave Creek Basin, is 1.9 miles long. "Centella" is the Spanish word for "thunderbolt." Be sure to notice the trees which have been struck by lightning on this exposed point. This area, which was the site of a small but hot fire in 1987, provides an excellent opportunity to observe how the forest regenerates after such a disturbance. Aspen, one of the first tree species to sprout after a fire, are growing on the north end of the ridge. Various wildflowers and grasses cover much of the fire site. Insects and birds are plentiful, and animals such as black bear seem to welcome rather than regret the meadow that has been created.